Challenges of this project: Tricarico was given an opportunity to develop an entire brand identity for Spirit Leaf, in addition to creating their Prototype Design. The team was faced with the task of designing a dispensary that mimicked a luxury retail store, normalizing the overall atmosphere while still elevating the cannabis experience through unique design elements and fixtures. Another complex undertaking was fashioning a flexible product and merchandizing display and overall layout capable with full modification capabilities. Overcoming these challenges: The overall brand aesthetic was created to speak the same language as major retail brands follow. The design team created a schematic plan that allowed for the customer journey to be open, free and less stringent – moving away from mainstream smoke shop models where transactions occur at one counter. The concept tells a story through art and imagery, which in turn produces a welcoming and comforting space that they can naturally connect with. High-end and versatile fixtures generate visual interest and seamlessly cater to the products at hand. 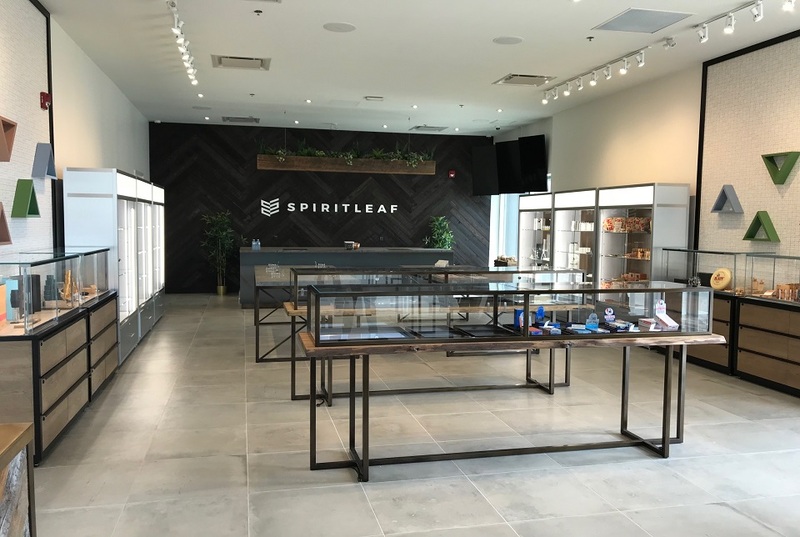 Results: Spirit Leaf is currently the largest franchised cannabis dispensary in the world, with over 250 franchisees signed on. Spirit Leaf is already forming a community and family throughout Canada, uniting consumers in a relaxing and secure environment.